There are some runs you know are just going to hurt. Like the anti-smoking ads, there are some runs you’d rather cut out. But when you’re training for a marathon, there’s not much room for choice. The sun was shining when I set off, but it being winter, I know it wouldn’t last long. There was maybe an hour of sunshine left, before dusk would set in, and eventually full darkness. I set off towards the Lea Vally, but would rather have headed off to bed. Saturday hadn’t so much passed in a flash as in a blur. The first day of the weekend is the domain of the smug runner – those who get their long run out of the way early on, so they can bask in the satisfaction of having got it done for the rest of the weekend. Instead, I’d spent a pleasurable lunchtime in a tasty restaurant in Islington, after which we decamped to one of my favourite pubs, and then made our way to a housewarming party. My shadow began stretching out before me, setting a pace I was never going to match, as I edged my way through the industrial estates that line the canal. The brutalist warehouses and tower blocks softened in the mellow dusk light. This was feeling like hard work. The party had felt like it might be coming to an end around 11ish as the South London folk made their merry way back to the last night bus. But then there had been something of a second wind, and we finally got home at 5:30. Even at the time I thought I was getting a bit too old for those kind of shenanigans, but now I was really feeling it. I trod gingerly through a section of muddy not-quite-flooding, which marked the closing metres before the M25 crossing. The light was fading quickly and the towpath was busy with dusk dog-walkers and cyclists heading back home after a day on the trails. Naturally, with such a late night, it had been a late morning. I’d dragged myself out of bed around 1, and faffed around getting myself ready. Where normally I’d do the weekly shop before my run, I had no option but to flip the routine on its head this week. As I passed the path to Cheshunt, the light faded to a dim dusk. 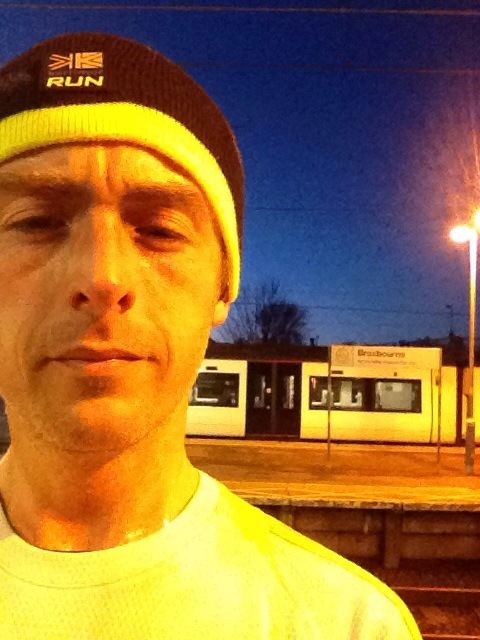 I needed to get to Broxbourne, where I would catch the train back to town, but the final stage would be in the half-dark. As I turned a corner in the river and the town’s lights became visible in the distance, the light faded fully. The final section was slow and largely involved trying to distinguish the path from the canal edge, but eventually I emerged into town safe – and tired. I jogged in the direction of the train station, and arrived – gratefully – just a few minutes before the train back to Seven Sisters. The whole journey back, I swore to myself that next time I was going to make sure I had a decent night’s sleep before my long run. But for the meantime, I was just glad to have got it done.